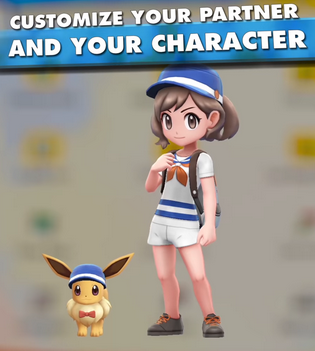 Along with having the ability to fully customize their Starter Pokemon, players will also be able to personally customize how their trainer will look in Pokemon: Let's Go, Eevee. Trainer Customization was first introduced back in the 6th Generation Mainstream Games, and it continued through the 7th Generation as well. Within Pokemon: Let's Go, Eevee, Trainer Customization can only be done in terms of altering the clothing your trainer can wear, not going as far as custom hairstyles and colors. This also comes with a catch, one that requires your Starter Pokemon to wear the same outfit as your trainer.